I like to add crumbled goat cheese after I toss the salad and dressing so it doesn’t get pasty. The cheese’s mild flavor and soft texture add dimension to the salad. Let’s just pause a moment to talk about the Fuji Apple Vinaigrette. Can I say “flavor explosion? !” This salad is at its best from October through December when apple cider is plentiful. The apple cider is really the key ingredient to give the dressing (and the salad) its “wow” factor. The fresh Fuji apples are crisp and juicy. Their sweet yet tart flavor is so refreshing. 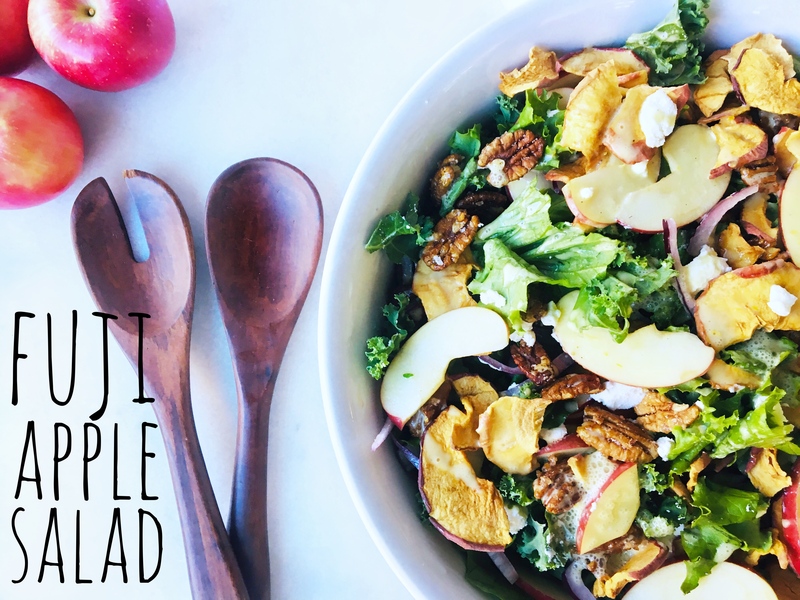 Add the crunch from apple chips and that apple-icious dressing and you’ve got a winning combination. You’ll love it for a holiday meal. *Note: Naturally BARE Baked Crunchy Fuji & Reds Apple Chips are available at Kroger grocery stores and other supermarkets. Cook apple cider in a saucepan until it reduces to 1/2 cup. Let cool. Wash and dry lettuce and tear into bite-size pieces. Core and cut apples into thin slices. Place pecans into frying pan on high heat. Add sugar and stir just until sugar melts on pecans. Pour pecans onto lightly greased foil or other non stick surface. Place all ingredients except goat cheese in a large bowl. Add 1/2 cup + Fuji apple vinaigrette and toss gently. Sprinkle salad with goat cheese.